Do you get frustrated with all the dirty fingerprint, make-up and other marks on your touch screens or with your mobile device sliding around in the car? Well we'd like you to meet Sticky 'N Grippy - the perfect solution. Sticky 'N Grippy Mobile Cleaner is our very useful little mobile/screen cleaner that sticks to the back of your device and simply peels off when you need to give your screen a quick wipe down. 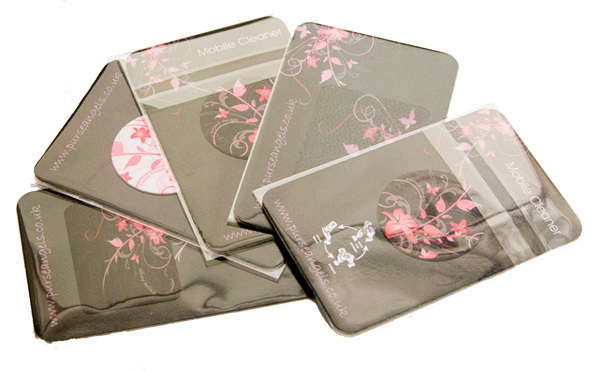 It absorbs all the little finger, dust, make-up and grease marks leaving your screen crystal clear. Then just replace it back onto your device ready to use whenever required. When the Sticky 'N Grippy starts to lose it's adhesiveness just run it under water and 'voila' it's sticky again! Sticky 'N Grippy Mobile Gripper is our clever little adhesive pad that attaches to the back of your mobile device and it's dimpled rubber surface stops it sliding around on your dashboard or the arm of your chair for instance. You can buy Sticky 'N Grippy as a pair or separately to suit your needs. We can also supply Sticky 'N Grippy with your own design and the minimum order quantity is just 100 pieces.